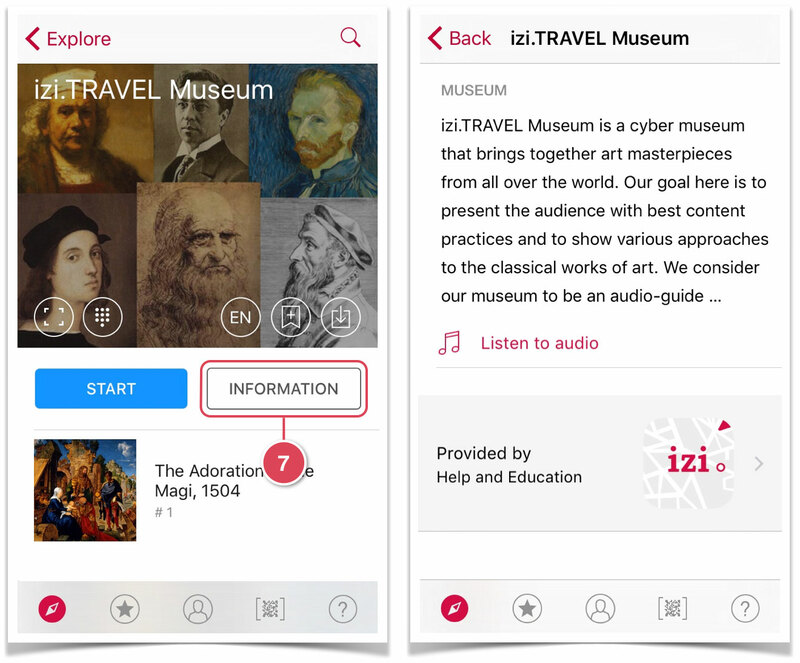 To check the created museum, open the mobile audio guide (izi.TRAVEL) on an iPhone. If it has not yet been installed, download and install the latest version of izi.TRAVEL. 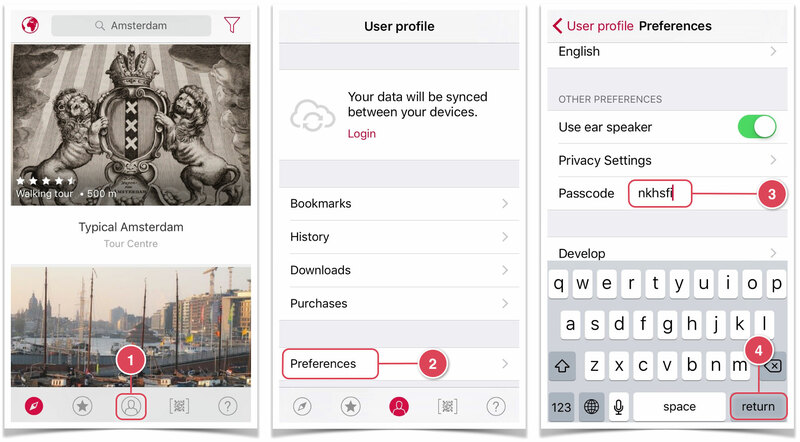 As mentioned in the previous section, access to the created museum view is protected by a passcode. 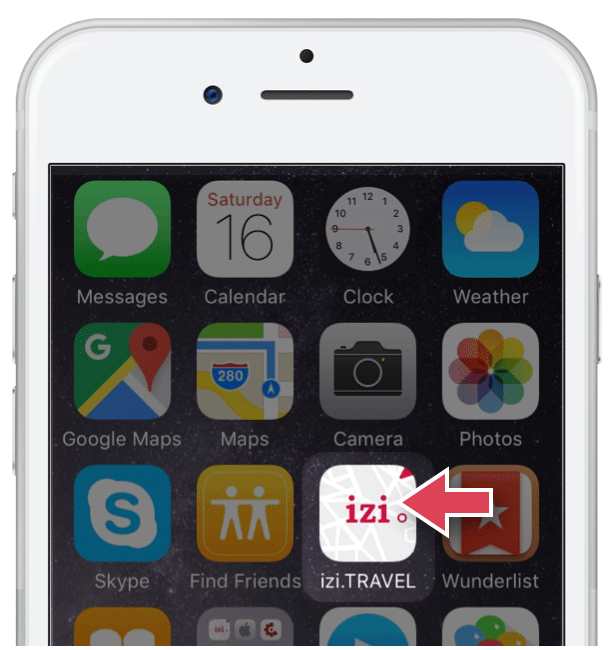 Manually enter the password into the izi.TRAVEL mobile audio guide settings; or. 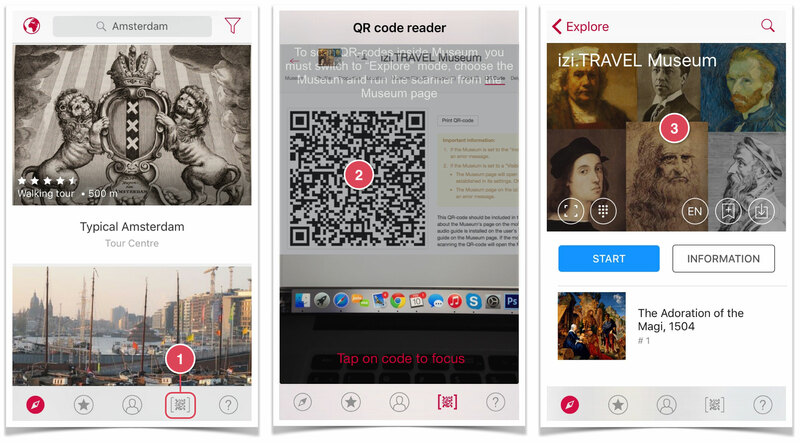 Scan the museum QR-code with the izi.TRAVEL mobile audio guide. Both of these methods are described in detail below. Go to the “Profile” section 1, select “Preferences” 2, in the new window enter the passcode in the same-name field 3, and press “return” 4. Now the museum list will contain the museum you have just created. Go back to the “Explore” section 5. Find the museum you’ve just created in the opened list and click on it 6. The museum’s main window will open. Check the text and audio which you uploaded when creating the museum. To do this, press “Information” 7. To play the audio story, press “Listen to audio”. Go back to the museum’s main window, and press the exhibit panel 8. Listen to the uploaded audio story by pressing the play button 9. To review the text, press Menu 10 and select “Read description” from the list which opens 11. Open museum features in CMS and go to the QR Code section (see the picture below). Your museum’s QR Code will be displayed on the page that opens. 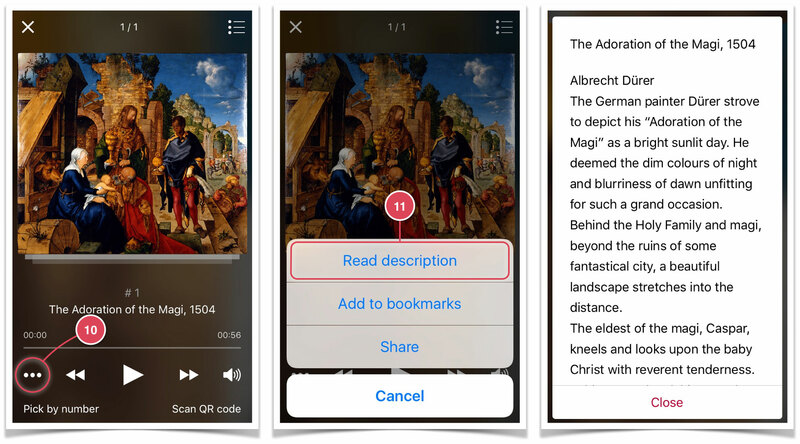 Scan that QR Code using the in-built izi.TRAVEL reader to open and see your museum in the izi.TRAVEL mobile audio guide. 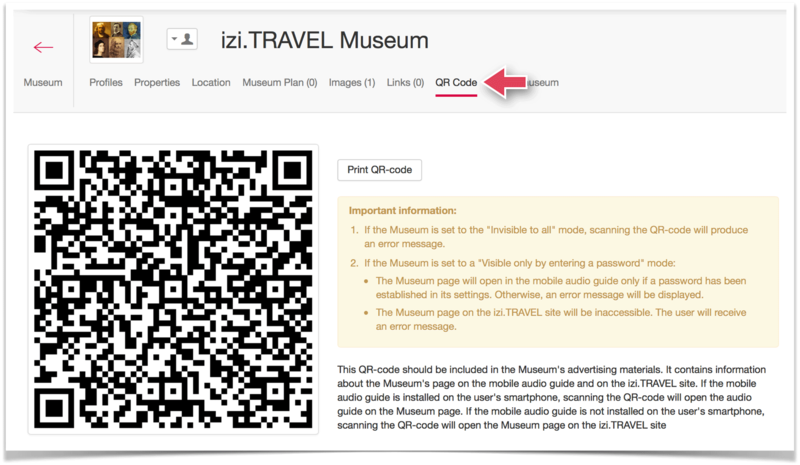 Open the izi.TRAVEL’s mobile audio guide, and select the QR code scanner 1. Point your smartphone camera at the computer screen so that the QR Code fits the scanner’s working area 2. Once the QR Code has been scanned your museum window will automatically open 3. Check that this is identical to the one described above. Now you understand how to create a museum and exhibits. You can also improve them or create new exhibits. 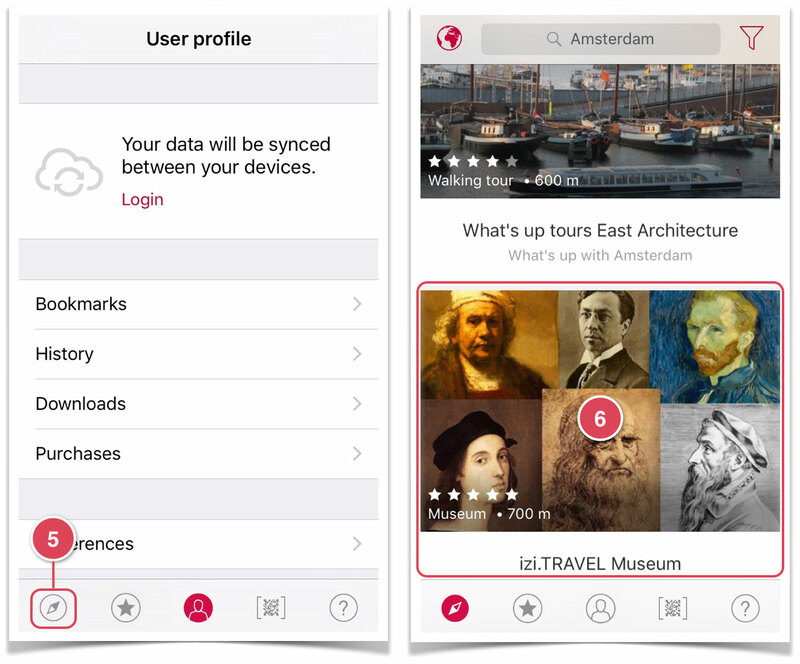 You can change or add new photographs of the museum and exhibits, upload a plan of the museum, and add audio descriptions, if you have not yet done so. As well as creating exhibits, you can create collections or add a museum, exhibits and collections in another language. 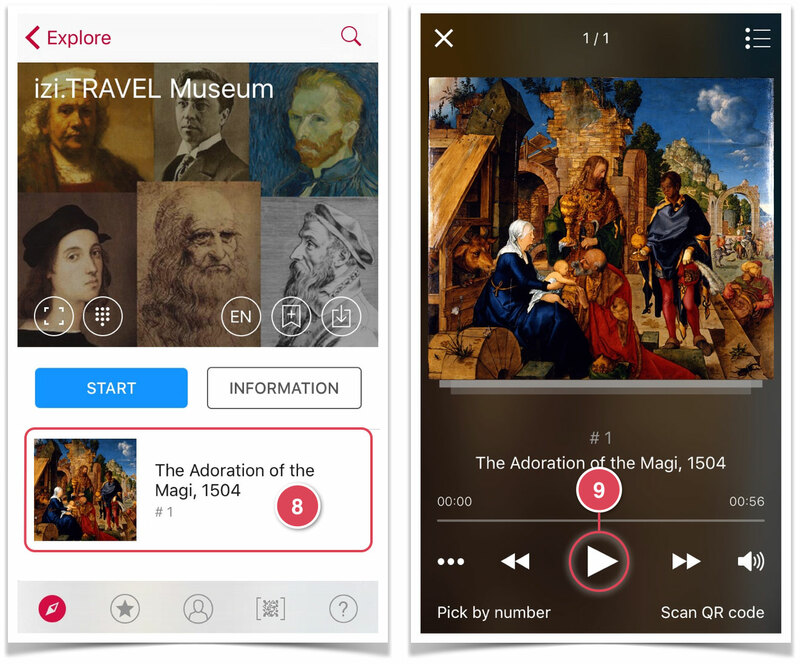 After you have finished creating the museum and exhibits, you can grant access to your museum to all mobile audio guide users.